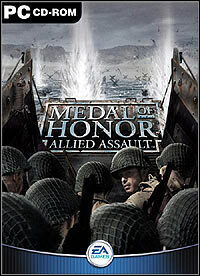 A tactical first-person shooter developed by 2015 and the first PC installment of the series which was launched on PlayStation in 1999.
publisher : Electronic Arts Inc.
Medal of Honor: Allied Assault is a tactical action game taking place during the Times of World War II, between 1942 and 1945. The player assumes the role of an American army soldier, sergeant Mike Powell, serving in the famous 1st Ranger Battalion, who gets recruited by OSS and fights in 20 missions based on historic campaigns of World War II. Every missions puts different challenges ahead of the player. In some of them, we have to carry out critical task in the enemy territory, and in some we participate in big military operations such as the landing in the Normandy and the assault on Arzew. The developers of Medal of Honor: Allied Assault created the audiovisual layer of the game with a great care. The game is powered by the Quake III engine, there are over 1000 separate character animations, sound effects were made by the award-winning team at EA Los Angeles, and the original soundtrack was composed by Michael Giacchino. The game allows to play both in single and multiplayer modes. Access to over 21 weapons consistent with the historic counterparts. 4 kinds of stationary weaponry. 18 enemy vehicles, such as Tigers or V2 missiles. Game score 8.86 / 10 calculated out of 5255 players' votes.